OPINION // Downloading is dead. Discuss. When did you last walk into a record shop, flickety-flack through the CDs (or 7″ records if you were too cool for plastic) and take your selection to the counter? OK, that question is an old one, and the answer too (“not since I went to emit sad, hollow laughs at the last Public Enemy LP”), but the point is still a prescient one, though in a whole new way. Downloading is dead. For those who obsessively follow technology news, then please roll your eyes and carry on planning your Web 3.0 start-up. For the rest of us, who use technology as a conduit more than a means to an end, this might be a bit of a surprise. Actually, maybe it won’t be – if you’ve used Spotify* a similar thought may have pinged into your mind’s inbox recently. A few years ago, music fans fretted over another harebrained scheme deriving from the record industry’s desire for ENDLESS CONTROL, in particular the mooted idea of changing the status of a customer’s ownership of the music itself. This sounded like rank stupidity, and made the route towards downloading and owning a song seem even more tempting than before. But as dumb as it still sounds, the no-ownership situation has come to pass, though perhaps not in the way the labels imagined. Music providers like Spotify make music ownership unnecessary now – and, most importantly, no-one cares. It is an indication of how quickly people will change their minds if they feel they are getting a good deal. These online streaming services are exactly that: the wildest dreams of any music lover coming true. If you’re happy to listen to an occasional advert, or pay a paltry sum per month, you can hear any music, whenever you want, however often you like. Why didn’t they sell it to us like this in the first place? Downloading is, therefore, now defunct. It’ll still exist as a viable outlet for smaller bands, and it will work in their favour. These bands can foster a relationship with fans, and these fans are happy to pay to support them. But for the Coldplay-buying public, spending time and money downloading from iTunes doesn’t make sense any more. I spoke to some record label types recently, and they all agreed, with the quiet urgency of people who have just spotted the departing train and begin running just quickly enough to catch it without breaking into a undignified rush, that ad-fuelled/subscription streaming services like Spotify are the future. I asked them about the future. They shuffled their feet and admitted that they didn’t even know what the music industry would look like in a year, let alone five. Heady times, ripe for change. Let’s hope the bands and the fans – the people that, you know, count – get a better deal this time. *And if you’ve not used Spotify yet – well, welcome back, Mr van Winkle; and now go here and prepare to lose the remainder of the day in slack-jawed bliss. Posted on April 10, 2010 by Joe Sparrow. This entry was posted in Featured, Featured Articles, Headline and tagged opinion. Bookmark the permalink. Not that anyone’s in the slightest bit interested- but to me, downloading is like masterbation, yes you get there, get a result, what you require, but it is has limited appeal sensually. Still enjoy going into a store flippin thro cd’s, vinyl, reading all the guff on the back covers, critiquing the artwork. Taking the item home, sitting on the bus considering the experience coming up. Like a meeting with someone- a real emotional interaction. Downloading is like a cheap. dirty debased thrill, yes you know loads out there r doing it, and that makes it the perverted, nasty pastime of the masses. I’m not one of them. and i’m glad. Now there’s an analogy I didn’t expect – but nicely put, if a little… gooey. Still – I think you’ve drawn your line in the sand: you’re part of the minority who love the record shop experience. I’m with you on that count. However, The vast bulk of people aren’t interested – they want music on demand and don’t want CD jewel-case clutter. iTunes has been a stop-gap: people now see music as a stream of unquantifiable data, if you like, which is where streaming services like Spotify come in. There’s no need for a connection with a physical object in most people’s minds – just like music was viewed a hundred years ago. Perhaps we’ve come full circle, or perhaps we’re heading into uncharted waters – the good news is that the new model will, I think, benefit both camps of consumers and, equally importantly, the musicians. At first I was dubious, the low bit rates of streaming music bug me. But I realized that it solves one of my current dilemma. I recently acquired a record player, and have started purchasing vinyl. I don’t exactly have a ton of money, so this puts me in the situation of having to decided what to download, and what to buy on vinyl, so that I get full enjoyment of each. Stream my my computer music for a small flat fee, and then buy what I like on vinyl, seems like the perfect option. Now I just need a 3G enabled device of some sort, cuz the mobile issue is still unsolved. If only Spotify would come out in the US. Maybe I’m too old to comment on this (not to mention, maybe the post’s too old to comment on) — but I grew up with vinyl, cassettes, then CDs and now iTunes. Radio was not really appealing to me because they didn’t play much that I was interested in. Granted, streaming audio is MUCH more broad — but for me, there will always be the pride of ownership — of a download. I won’t have to worry about the station I love suddenly folding for lack of support, and then — oops — there goes my source for my music. Sure, streaming is the best for the music-of-the-moment folks, but for those of us who like to preserve our listening tastes for posterity, it just doesn’t meet the need. That statement is one of those that certainly feels like it should be true, but it’s not. First of all, when it comes to albums, there are still twice as many CD buyers out there than those who go the digital distribution route. And even if that changes in 2015 (as some are predicting,) it will still be a multi-billion dollar business. You can’t accurately say “no-one” cares about owning music. Secondly, music ownership may seem more necessary to the consumer when those “paltry sums” start edging up and up or when streaming providers decide that certain albums aren’t worth the bandwidth so they don’t post the music. (Think of the monopolies cable TV is constantly trying to create. Why would music streaming providers be any different?) Music ownership will certainly be necessary to the artists, many of whom are currently being badly cheated out of fair compensation for their work that’s posted on streaming sites. These people are not going to work for nothing forever. 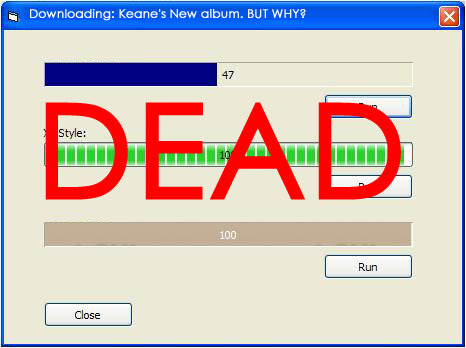 As a lifetime lover of music and collector of CDs, I celebrate the death of downloading — a vile idea from the first. But I am AMAZED that no one discussing the music recording industry can ever imagine a future in which vinyl, CDs, streaming and radio can all co-exist together. Why do these discussions always have to be so “either-or”? Just because a faster, more economical car comes out doesn’t mean that there is NO market for high-end vehicles anymore. People go the route that suits their needs and wants! Why is it that home entertainment fans can’t wrap their minds around this concept? True, there’s plenty of hyperbolic/provocative statements up there (but hey, that’s music blogging for you). I agree, there will always be a market for CDs, vinyl, and any physical format you may care to name… but now that most teens’ method of consuming pop music is via Youtube, I’m uncertain as to how many of them will decide to migrate from that starting point to purchasing physical media. I speak as someone who loved buying CDs: consumed the inlays rabidly, scoured the small print, read the lyrics, etc – but I’m also a realist who rarely feels the compulsion to buy CDs now, when Spotify/Youtube has entirely changed the consumption of music. If I do buy, I’ll buy second hand CDs for a price that feels right: i.e. way below the default £10 barrier – in many ways, buying CDs now feels like paying for the inconvenience of importing a CD to iTunes/etc. Music is consumed in such a wildly different manner to even five years ago, that there is naturally a cross-over period. We’re in it now. I have no hard evidence (of course: blogging and stats are mutually exclusive! ), but walk into an HMV (if you can find one), and you’ll see the majority of floorspace put aside for physical stuff that sells – and it’s mainly not CDs/vinyl. My point is the majority of consumers couldn’t care less about physical music’s demise. They prefer the brave new world, flaws and all. People like you, and to an extent me, who like either the idea of ownership or simply holding an object in our hands to associate with the ethereal sounds emerging from the speakers, will always exist… so yes, I suppose your high-end car concept applies. But how many people can afford those or care about them enough to buy one? There will always be niche producers selling physical music media, just as you can still buy 35mm film for your SLR if you want to persevere with film photography. But on the whole, I don’t care enough. Music was never purchasable as a take-home product prior to ~1920… and now we’re at a point where rightly or wrongly, recorded music has lost its value to a great extent. Maybe one day music ownership will be looked upon as a frivolity, a quirk, or whatever. Maybe not. Artists need to be paid for what they create – I’m very firmly behind that concept – but the old model of providing that compensation is, well, old now, whether we like it or not.